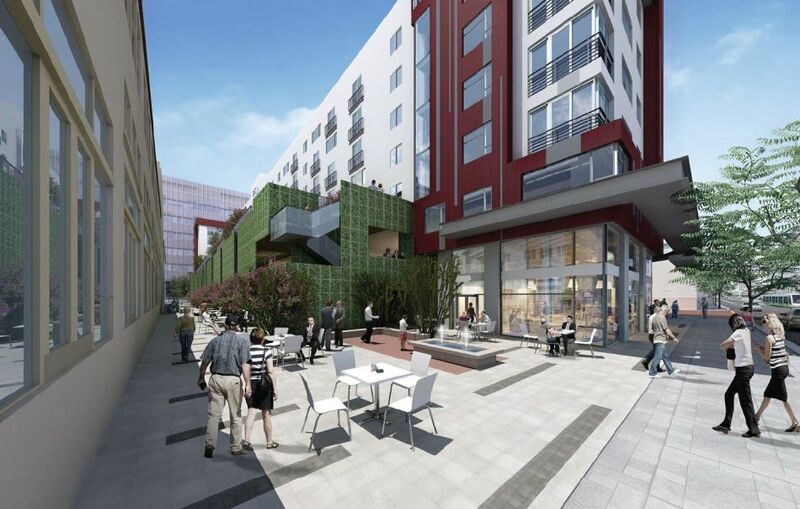 Located at the southeast corner of 11th and Hill Streets, will contain 177 apartments, 7,300 square feet of ground-floor retail space and parking accommodations for up to 276 vehicles and 201 bicycles. The residential-retail complex will provide a mixture of studio, one- and two-bedroom dwellings. 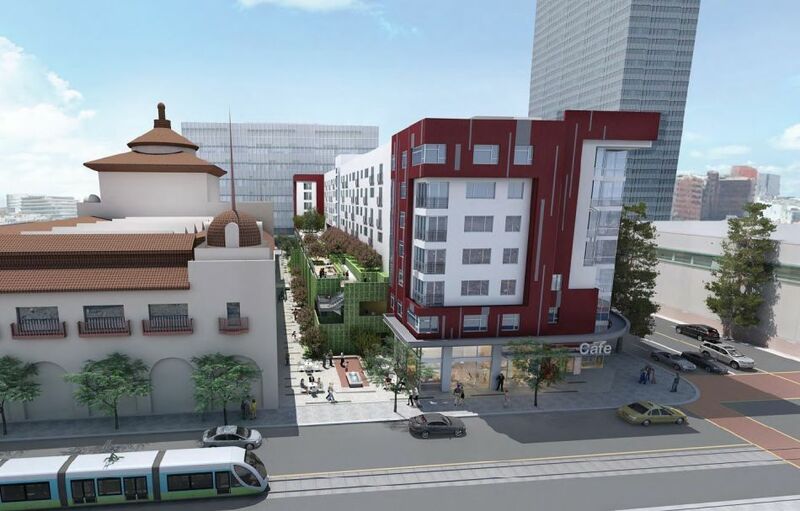 Plans also call for a variety of common area amenities, including a swimming pool, an exercise facility, and a pedestrian paseo adjacent to the historic Herald Examiner building. 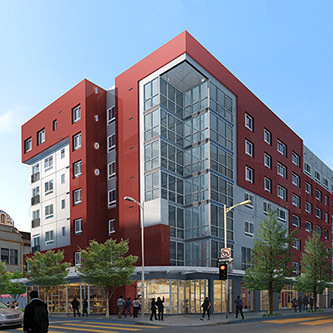 The smaller of the two buildings, located at 11th and Hill Streets, will offer 177 studio, one- and two-bedroom apartments above 7,300 square feet of ground-level retail space and parking accommodations for 276 vehicles and 201 bicycles. 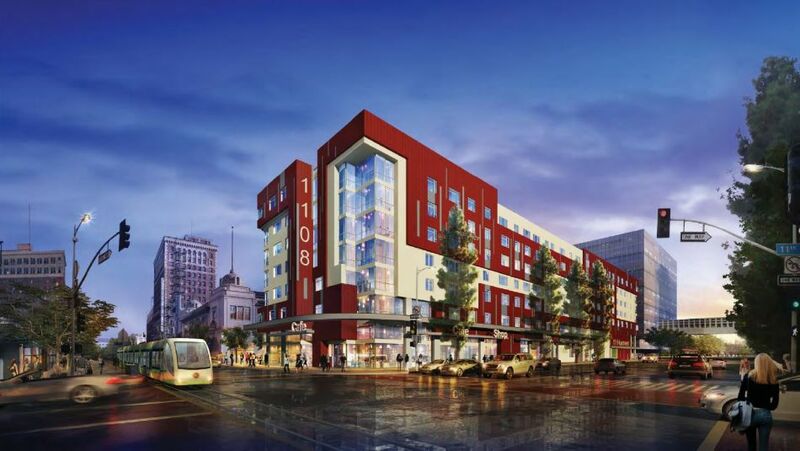 Renderings portray a seven-story structure clad with white stucco and red metal panels, highlighted by a landscaped paseo adjacent to the Herald Examiner Building. The larger building, situated one block east at 12th Street and Broadway, will feature 214 studio, one- and two-bedroom apartments above 9,000 square feet of commercial space and parking accommodations for 231 vehicles and 245 bicycles. The seven-story structure, clad with white stucco and blue metal panels, will offer residential amenities such as a fitness center and a rooftop observation deck.